We are committed to a Clean Environment! A Flush Away offers an earth- and people-friendly line of tank deodorizers, cleaners and air fresheners. These are effective, environmentally-conscious products created by Green Way Products. We have recently introduced an expanded line of portable sanitation deodorizers, including two new liquid-based deodorizers – Blue Works and Bio Works. 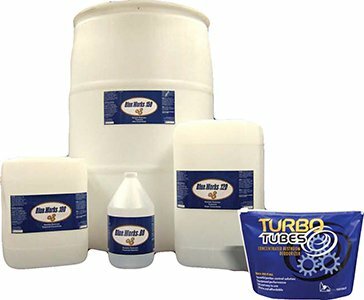 Our most recent addition is the Turbo Tube, a highly-concentrated liquid deodorizer in an easy-to-use single use package. We’ve also recently made available a new line of Water Treatment products, Earth Works Water Treat, designed to eliminate waste water odor, corrosion and fats, oils and grease build up. This product is perfect for septage haulers, waste water treatment facilities and for those who service grease traps. In addition to Green Way’s Earth Works line of tank deodorizers, A Flush Away distributes the powerful Airworks air freshener disks, Spray Works fragrance boosting spritz, and a full line of cleaning products – Power Clean, for aggressive cleaning projects, and Clean Works for more moderate clean up jobs, Scale Works urine de-scaler, and Water Works fragranced wash down concentrate.